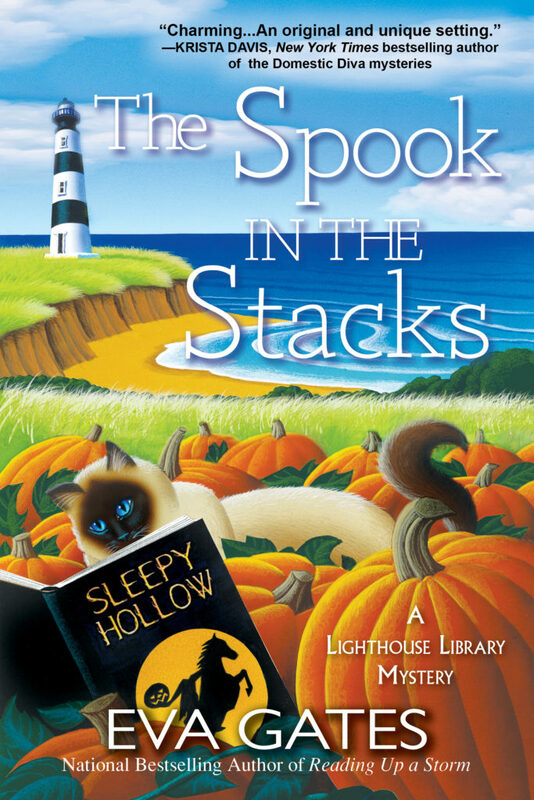 I love a good cozy mystery with great characters, a good storyline that keeps me guessing, and a beautiful setting! Eva Gates gave me all of that and more! The book opens with the staff getting ready for Halloween and a wealthy businessman, Jay Ruddle, is seriously considering donating his historical documents to the library. However, the library is just one place he is considering, so the competition is FIERCE! Things take a turn for the worse when Jay is found by Lucy in the rare books section. Lucy finds herself in the midst of another mystery to solve. There is no shortage of suspects. Gates gives just enough about each one to keep me guessing. I would think I had it figured out, and she would throw a twist in that would have me guessing again. The Halloween theme and the strange, mysterious things happening just added even more to the book. Characters are always such a driving force in a book for me. Gates has really created some great characters who have many levels. I admire the relationship they all have with one another, especially Lucy and her friends. Oh, I loved Charles, the library cat! He was the best!!!! I have always wanted to go to the Outer Banks, and Eva Gates has made me want to go even more. The setting is beautiful. She writes in such a descriptive way that I found myself right there in the story as well. 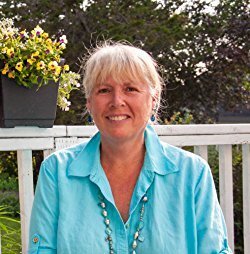 The icing on the cake for me is The Bodie Lighthouse is a real working lighthouse, not a library as she indicates in her note at the end of the book. Yes, Eva Gates your writing helped it all come alive in my imagination. I can’t wait to take my next journey with the next book!!!! Lucy, do you and your friends fear for your lives at times because you all are uncovering murderers? I guess it’s only after it’s all over that I think, “oh, my goodness. That might not have been such a good idea.” Maybe I’m so focused on trying to do the right thing that I forget I’m putting myself into danger. My friends do try to warn me, though. I don’t think my boyfriend is all that happy with my attempts at detecting. Detective Sam Watson certainly isn’t. But what else can I do? If you weren’t a librarian, what other career would you choose? I’d definitely want to do something with books. So maybe I’d like to work for a publisher. I’d love to read new submissions, and hopefully discover somethings new and exciting. Since you are surrounded by books, what are your favorite genres to read? I read a lot of classic novels, because I run the Bodie Island Lighthouse Library Classic Novel Reading Club. This month we’re reading The Legend of Sleepy Hollow and other works by Washington Irving to get us in the mood for Halloween. In my own time, when I have some, I have a weakness for cozy mysteries. Nothing better than curling up with a good book in the window seat in my Lighthouse Aerie or taking with me for an afternoon at the beach. If you could live anywhere besides the Outer Banks where would it be? I have to say: Nowhere! I’ve chosen to live near Nags Head because it’s my favorite place in the world. I’m actually from Boston, and I lived in Boston all my life until less than a year ago. For cozies, I love Kate Carlisle or Jenn McKinlay. I also like modern gothic suspense such as written by Kate Morton or Simone St. James. Melody was so busy in her head, that she didn’t notice the man in front of her and slammed right into his very sweaty, very hard body. She gripped his arms, his thigh going right between her legs as she pressed into him and looked up. She hadn’t let go of his arms, but he hadn’t moved away from her either. She was aware that there were other people in the gym, but she knew they weren’t looking at them. They were focused on their workouts and not the two of them clinging to each other as if they couldn’t get enough. And because she thought that particular thought, she let go of him and backed away. Her inner thighs missed Fox’s touch immediately, but she ignored her traitorous lady parts and their needs and desires. Damn them anyway. They always got her into trouble. “I’m fine, and I’m the one who ran into you anyway.” She swallowed hard, doing her best not to think about how exactly he’d felt pressed up against her. He fit far too perfectly, and she hoped the fact that she couldn’t stop thinking about it was because she was hyped up for the gym. And in terms of rationalizations, she’d just reached a new level. He frowned. “If you’re sure.” He reached out as if to touch her before lowering his hand. For two people who had vowed to try and be friends, they were acting far too awkward for their promises to be of any consequence. If there were a sinkhole for her to fall into, she’d look for it because, dear God, what was wrong with her?